Just wrapped up a thoroughly enjoyable weekend at the beautiful Minot State University in Minot, ND teaching Myokinematic Restoration. Thank you to Minot State faculty Dr. Heather “Rockstar” Golly and the Beth Marschner “twins” for their help in coordinating this course at their gorgeous third floor facility with a view of the campus. The Minot State team made me feel like family from start to finish. 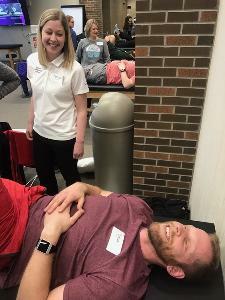 This class included an interdisciplinary group of movement scientists including Maci Severson, ATC, Holly Thompson, PT, Kevin Melby ATC, PTA, Dawn Mattern, MD among others in a largely new to PRI crowd. Many thanks to newly minted PT, PRC Bridget Anderson, who did a great job as lab assistant throughout the course. Course participants engaged in discussions about PRI theoretical principles, scientifically based rationale for testing and treating the normal asymmetry seen and learned special tests to assess acetabulum and femur relationships. Course participants like Kevin Melby, Micki LaDage, Jodi Swedlund, Samantha Brizee among others volunteered to participate in lab activities to practice PRI special tests and how to use PRI techniques to develop a treatment plan with progression. Thank you to all who helped during lab time by allowing course participants to see examples of normal polyarticular chain patterns of muscle and inhibition techniques that affect them! A lively, thoughtful and robust group, it helped me really enjoy my time in the “sister state” of North Dakota this weekend. Thank you each for adding to PRI nation and for jumping into the science of PRI with candor and zest!